Chauvet Freedom Pack Stick Battery Powered LED Light Effect DJ Disco Lighting. 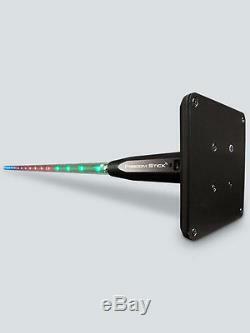 Freedom Stick is a unique and versatile free-standing RGB LED that can be pixel-mapped for ultimate programming creativity. This battery powered fixture has a built-in D-Fi receiver that allows it to be placed anywhere. The sticks also work excellently as truss warmers. User-customizable automated programs create complex looks in seconds. Additional control options include auto and sound programs via DMX, wireless master/slave or the IRC-6 remote. 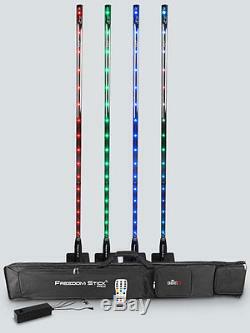 Unique and versatile free-standing LED array that adds pizazz to any event. Battery-powered and built-in D-Fi receiver allows the stick to be placed anywhere. Each LED can be pixel-mapped for ultimate show and programming creativity. Includes a carry bag and multi-charger for easy transportation and charging. Control auto and sound programs via DMX, wireless master/slave or the included IRC-6 remote. Use as a dazzling tabletop centrepiece, outlining aisles, room separator or inside sticks of truss for the ultimate truss warmer. DMX Channels: 3, 8, 48 or 50. 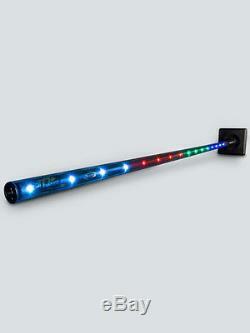 Light Source: 32 SMD LEDs (tri-color RGB) 0.2 W (50 mA), 50,000 hours life expectancy. Strobe Rate: 0 to 30 Hz. Maximum Run Time: (all on): up to 6.5 hours. Recharge Time: 4.5 hours. Input Voltage: 15 VDC, 800 mA (external power supply: 100 to 240 VAC, 50/60 Hz). Unit with Base: 161 x 161 x 1550 mm. Bag size: 1535 x 65 x 220 mm. Simply Sound and Lighting have been trading for 10 years and love providing our customers with technical advice, great service and shiny new products! We offer a wide range of sound and lighting equipment from over 30 different brands. After 30 days faulty goods will be repaired or replaced if repair is not possible. The item "Chauvet Freedom Pack Stick Battery Powered LED Light Effect DJ Disco Torn Box" is in sale since Friday, September 28, 2018. This item is in the category "Sound & Vision\Performance & DJ Equipment\Stage Lighting & Effects\DJ Lighting Single Units".